Welcome to unique nature lover’s villa. Spacious, well furnished villas with wooden floors, shuttered windows and gorgeous locally carved beds. This beautiful property is placed in a secure gated community with the most impressive, breath taking panoramic views of Discover Bay and the clear crystal waters of the Caribbean Sea. The property features a fully fitted diner, well equipped lounge area with TV, music system, play station, board games and Internet access. Each en-suite bedroom is spacious and copy with A/C, cable TV, safes and walk in closets. 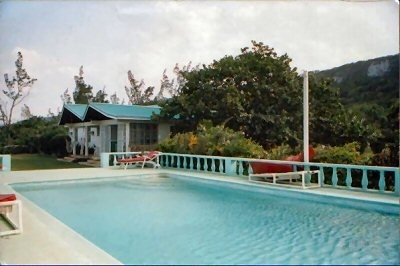 The villa has large verandas, outdoor furniture and hammocks, visitors have the use of a fully equipped main kitchen. The kitchen area has every appliance you could probably need, including a blender for mixing up cocktails & a cafeteria to make that fresh cup of coffee in the morning! Towels, linen & soft furnishings are color harmonized, creating a bright & cheerful atmosphere. The villa is within walking distance of great restaurants, with a variety of cuisine. You have easy access to supermarkets, beach side bars, nightclubs, Internet cafe not to mention excellent shopping right on your front door! Villa vacation rental rates $1000 per week. Rates are subject to change without notice. Rates in U.S. dollars included taxes. Rates are for entire villa, fully staffed for 7 nights. $75 a night surcharge for extra guests. Please confirm rates as they are subject to change. Ask about deposit requirements. Cancellations are subject to a fee.